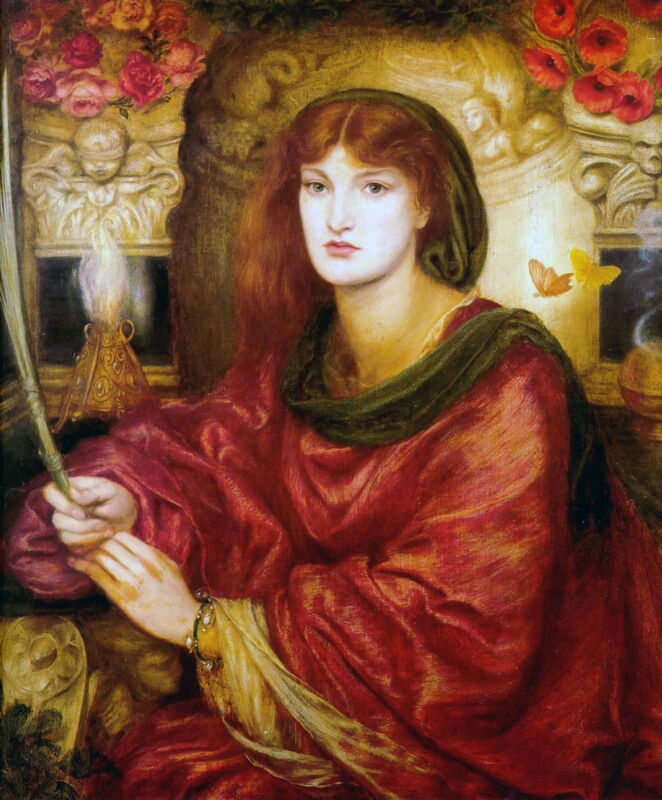 Dante Gabriel Rossetti (1828–1882), Sibylla Palmifera (Venus Palmifera) (1866-70), oil on canvas, 98.4 x 85 cm, Lady Lever Art Gallery, Liverpool, England. Wikimedia Commons. In the first of these two articles, I showed paintings of Christian sibyls which were made before 1650, when they fell from favour. Angelica Kauffman (1741–1807), A Sibyl (1775), oil on canvas, 125.1 x 94 cm, Private collection. Wikimedia Commons. In 1775, Angelica Kauffman painted this faithful copy of Guercino’s The Persian Sibyl from 1647-48. I don’t know whether this was commissioned or for her own benefit. Louise Élisabeth Vigée Le Brun (1755–1842), Life Study of Lady Hamilton as the Cumaean Sybil (1792), oil on canvas, 73 x 57.2 cm, Private collection. Wikimedia Commons. 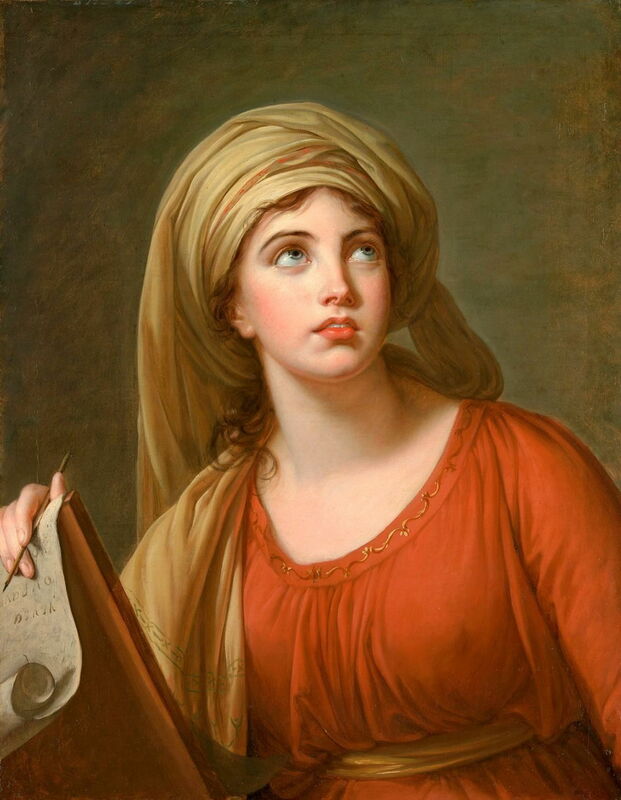 Shortly after that, in 1792, another of the great pioneer women painters, Louise Élisabeth Vigée Le Brun, painted a Life Study of Lady Hamilton as the Cumaean Sybil. She follows the traditional rules with an ‘eastern’ headdress, distinctive robes, a scroll, and a heavenly gaze which serves to emphasise the subject’s great beauty. Orest Kiprensky (1782–1836), Portrait of Russian Opera Singer and Actress Nimfodora Semenova (1788-1876) in ‘La Vestale’ (1828), oil on canvas, 110 x 90 cm, A.A.Bakhrushin State Central Theatre Museum Государственный центральный Театральный музей им. А. А. Бахрушина (ГЦТМ им. А.А. Бахрушина), Moscow, Russia. Wikimedia Commons. 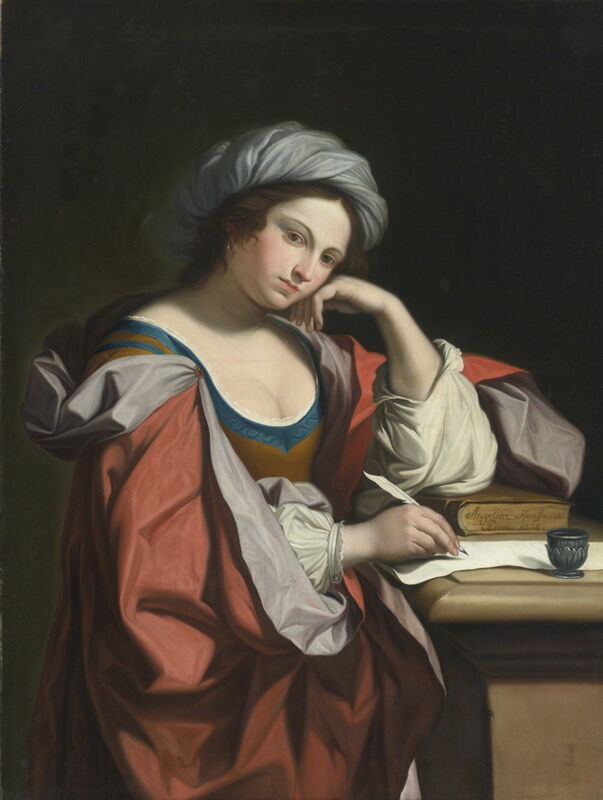 The idea of a ‘Christian sibyl’ was lost, but sibylline characters appeared on stage in plays and operas. 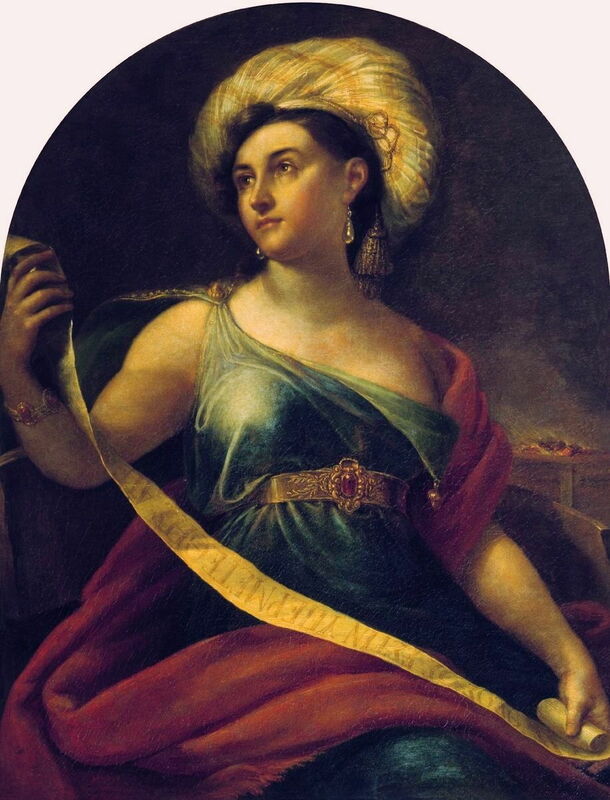 Orest Kiprensky’s Portrait of Russian Opera Singer and Actress Nimfodora Semenova (1788-1876) in ‘La Vestale’ painted in 1828 restates the traditional attributes, although the Renaissance artists wouldn’t have dared to expose as much of the sibyl’s chest. 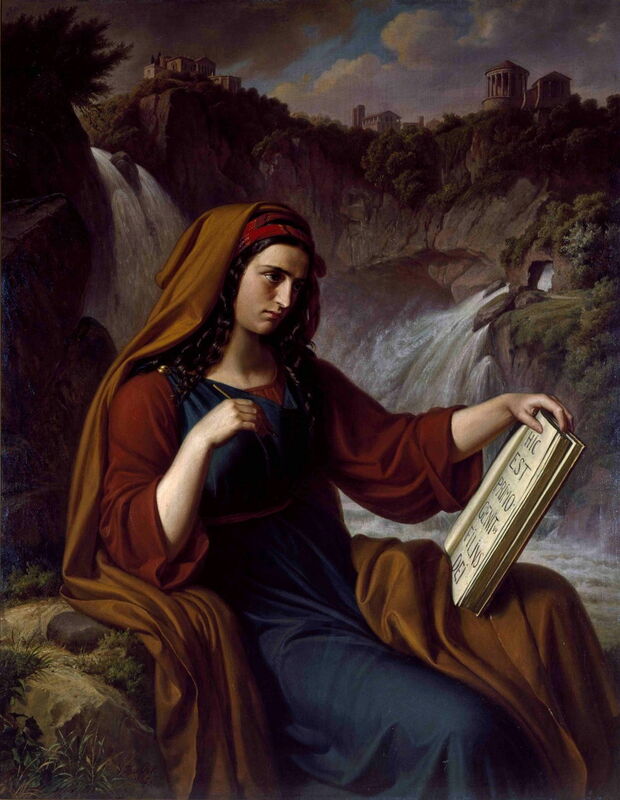 Theobald von Oer (1807-1885), Tiburtine Sibyl (1865), oil on canvas, 131 x 103 cm, Museum Abtei Liesborn, Wadersloh, Germany. Wikimedia Commons. Then, in late nineteenth century reinventions of painting style, sibyls started to appear again, now without any religious association. Theobald von Oer’s Tiburtine Sibyl from 1865 adds a Tivoli backdrop to the standard combination of headdress, robes, book and gaze. You might expect the Pre-Raphaelites to have returned to painting sibyls too. Dante Gabriel Rossetti did, in his Sibylla Palmifera (Venus Palmifera) from 1866-70, one of his sultry portraits. Instead of a book, she is holding a palm frond, as suggested by the title. But there is ambiguity too, with a blindfolded cupid in the molding at the left, and another sculpted head staring from above her right thigh. Edward Burne-Jones (1833–1898), Sibylla Delphica (1868), oil on canvas, 152.8 x 60.3 cm, Manchester Art Gallery, Manchester, England. Wikimedia Commons. At about the same time, Edward Burne-Jones painted this Sibylla Delphica (1868), who is dressed for her role but she too holds aloft leaves rather than records of prophecy. Behind her is a tripod altar aflame. Paintings had returned full circle to the pagan sibyl, their strange Christian connotations quietly forgotten. There is one other theme in which paintings show sibyls. Giuseppe Crespi (1665–1747), Aeneas, the Sibyl and Charon (c 1695-1705), colour on canvas, 129 × 127 cm, Kunsthistorisches Museum, Vienna, Austria. Wikimedia Commons. 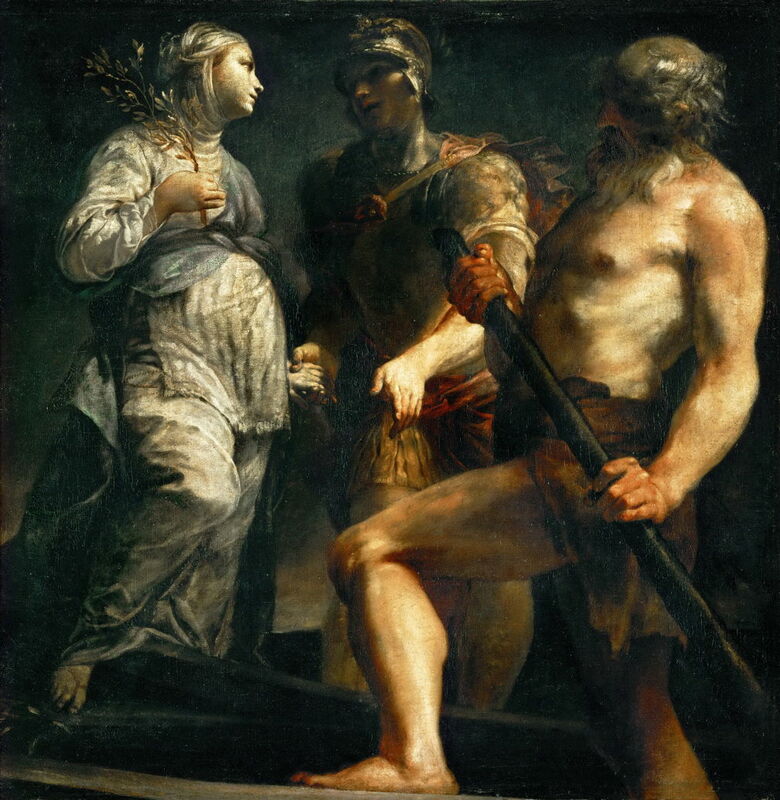 This is shown well in Giuseppe Crespi’s dramatic painting of Aeneas, the Sibyl and Charon from about 1695-1705. In Virgil’s Aeneid, its hero Aeneas visits the Underworld with a sibyl as his guide, shown here with Charon, the boatman who conveys them across the River Styx. Claude Lorrain (1604/1605–1682), Coast View with Apollo and the Cumaean Sibyl (c 1645-49), oil on canvas, 99.5 × 127 cm, Hermitage Museum Государственный Эрмитаж, Saint Petersburg, Russia. Wikimedia Commons. 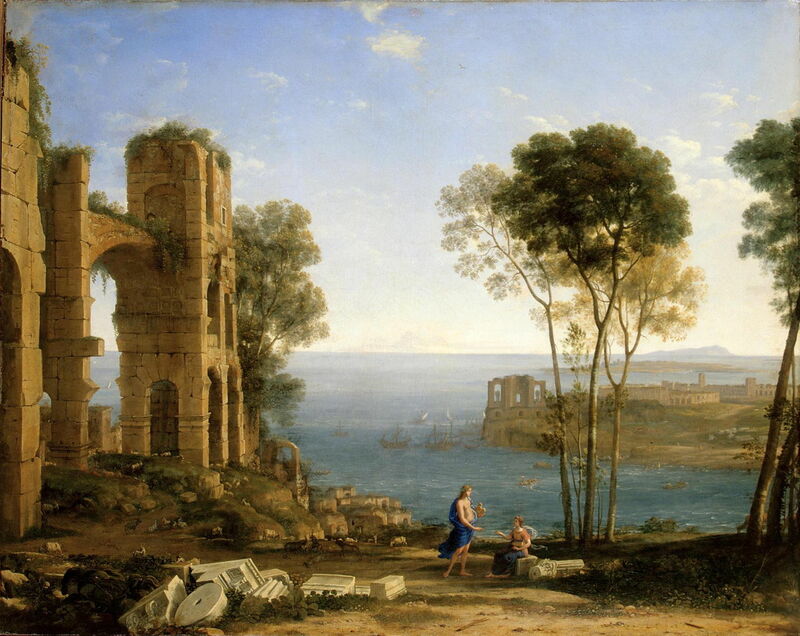 This is incorporated into one of Claude Lorrain’s most wonderful coastal landscapes, his Coast View with Apollo and the Cumaean Sibyl from about 1645-49. Although their figures are small, Apollo on the left is holding his lyre in his left arm, trying to persuade the seated Sibyl, to the right, to let him take her virginity. Around them are the ruins of classical buildings and a stand of tall trees, as the land drops away to an idealised view of the coast of Italy. I suspect that the island on the horizon is based on Capri. François Perrier (1594–1649), Aeneas and the Cumaean Sibyl (c 1646), oil on canvas, 152 × 196 cm, Muzeum Narodowe w Warszawie, Warsaw, Poland. Wikimedia Commons. When Claude was painting his coastal view, François Perrier was painting a more conventional figurative account of Aeneas and the Cumaean Sibyl (c 1646). Aeneas, stood to the left of the incense burner, appears to be offering to burn incense in honour of the sibyl, who stands at the right in front of her cave, and is just about to tell him her life-story. 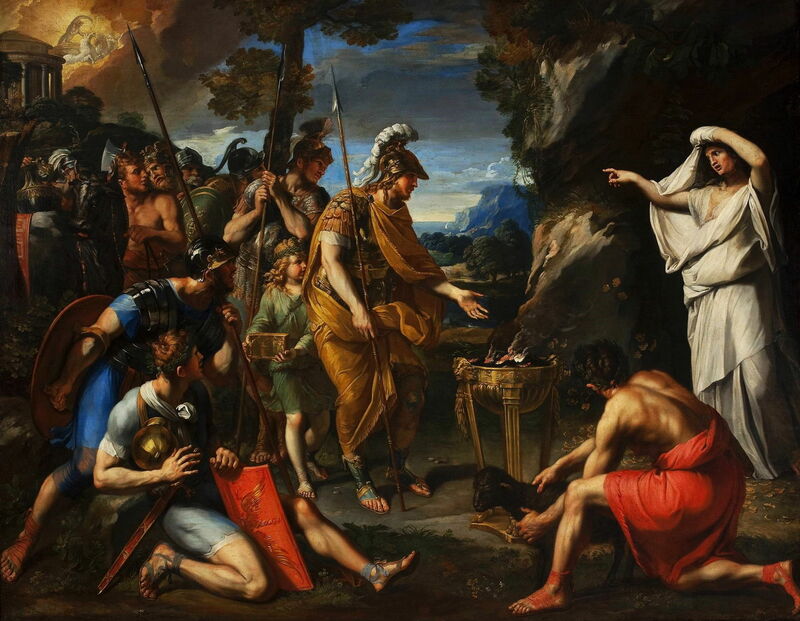 Behind Aeneas is a queue of people, including a king, bearing gifts and waiting to consult with the sibyl. At the top left corner is a temple, and in the clouds above it the god Apollo. Joseph Mallord William Turner (1775–1851), Lake Avernus: Aeneas and the Cumaean Sybil (1814-15), oil on canvas, 76 × 92.7 cm, Yale Center for British Art, New Haven, CT. Wikimedia Commons. JMW Turner’s first version of this scene is thought to have been his first mythological painting, made early in his career, in about 1798. This second version, Lake Avernus: Aeneas and the Cumaean Sybil, dates from 1814 or 1815, and is both an improvement on the original and in better condition. 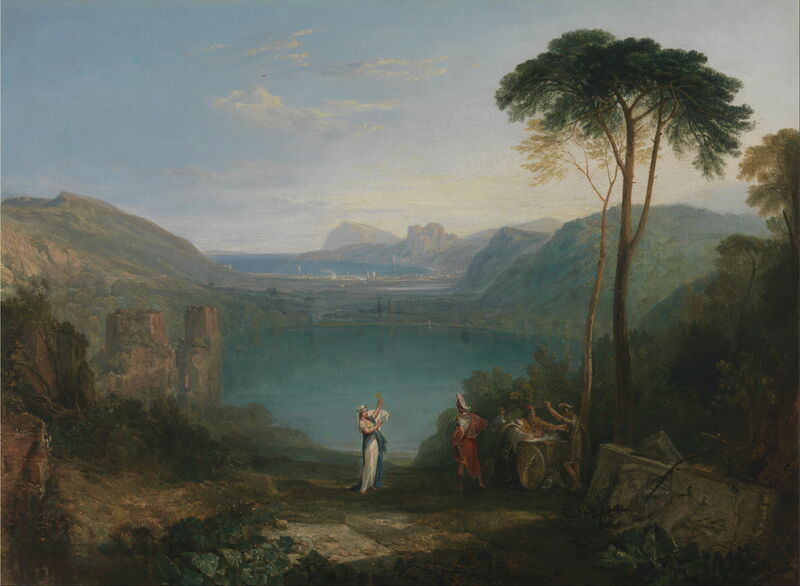 True to the spirit of Claude’s landscape, this too is a mythological landscape showing the beautiful setting of Lake Avernus, near Pozzuoli, to the west of the city of Naples. In the distance is Baiae and the cliffs of Cape Miseno. The Sibyl, who does not show her years, holds aloft a golden sprig rather than a bough, and Aeneas stands with his back to the viewer, as if he too is enjoying the view. 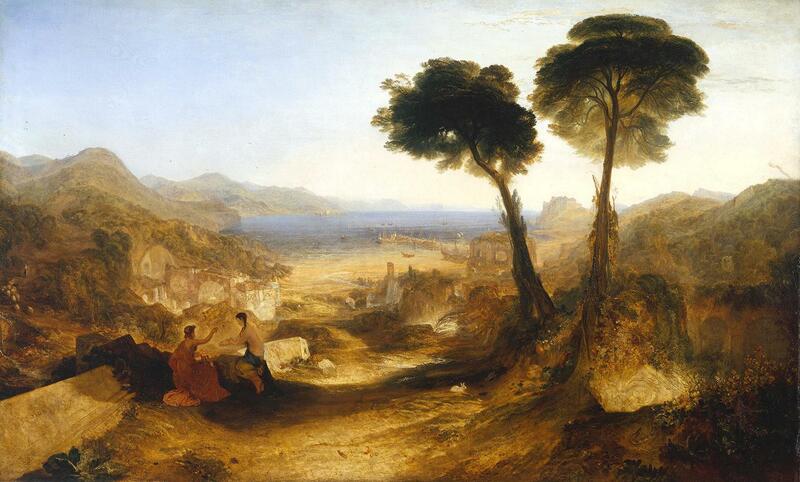 Then in 1823, Turner painted another scene from the same story, in The Bay of Baiae, with Apollo and the Sibyl. His view appears to have been loosely based on Claude’s, with common elements, but has been recast at Baiae, in the Bay of Naples. Apollo is again on the left, with his lyre, but the dark-haired sibyl has adopted an odd kneeling position. She is holding some sand in the palm of her right hand, asking Apollo to grant her as many years of life as there are grains. 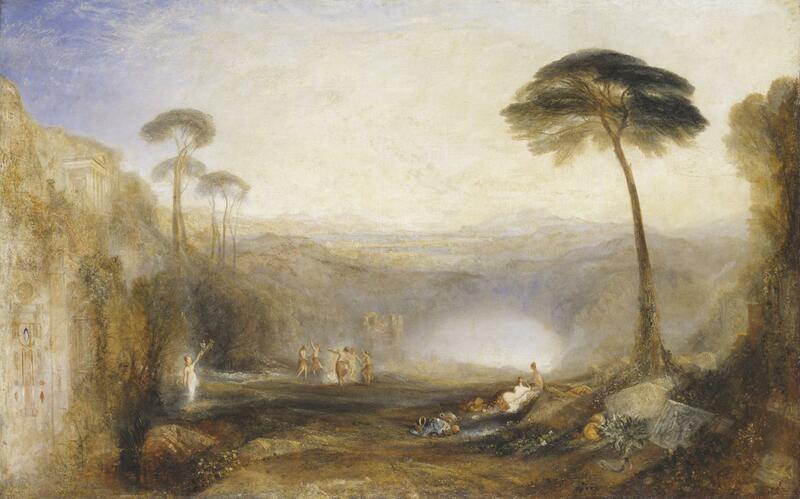 Turner’s last account is The Golden Bough, which he exhibited in 1834. It shows well how much his style had changed, although it retains compositional features from his earlier paintings. The Sibyl stands on the left, radiant in white light, and holding aloft a more substantial golden branch than Turner showed previously. Her right hand holds a golden sickle used to cut that branch. Down towards Lake Avernus are the Fates, dancing around another white glow. A couple of female companions of the sibyl rest under the tree, but Aeneas is nowhere to be seen (he might be in the middle of the Fates, perhaps). In the right foreground is a snake, a symbol of the underworld. 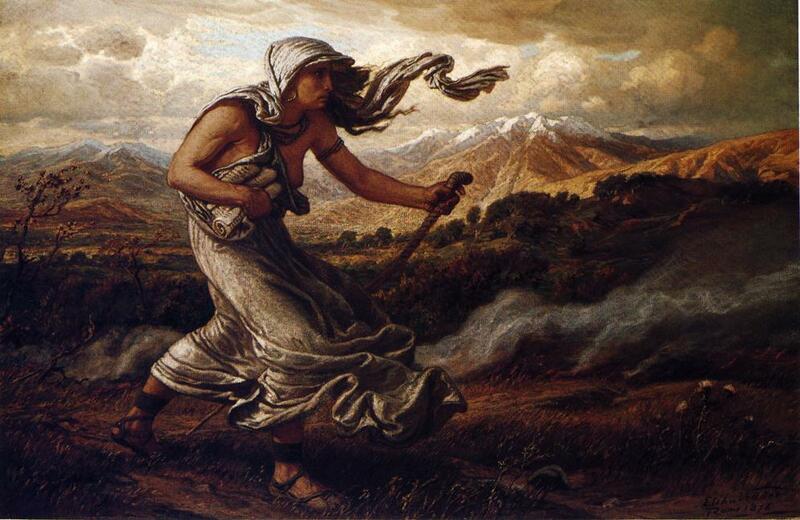 Finally, in 1876 Elihu Vedder painted a contrasting version of The Cumean Sibyl, showing her in her other main role, going to sell the Sibylline books of prophecies to the last king of Rome. She strides out clutching these scrolls under her arm. I hope these paintings have provided better context for reading Velázquez’s paintings of sibyls. Posted in General, Life, Painting and tagged Burne-Jones, Claude, Crespi, Kauffman, Kiprensky, Lorrain, painting, Perrier, Rossetti, Turner, Vedder, Vigée Le Brun, von Oer. Bookmark the permalink.